Germany's summer seems to have hit the lowest point: It's 12C outside and it's wet wet wet. It's anything but summer. Idon't think it can get much worse than this. But I won't complain. There is still so many things that I will enjoy while I am here, that I will not have in Dubai. Like local food. The local fruit and vegeables are so good, they have a hard time to make it into a pot or pan. We eat them just on their own and raw: strawberries, cherries, overripe gooseberries, plums, raspberries, red currants, everything tasting like in my grandma's garden when I was a kid when we would eat them right there, freshly picked from the trees and bushes. 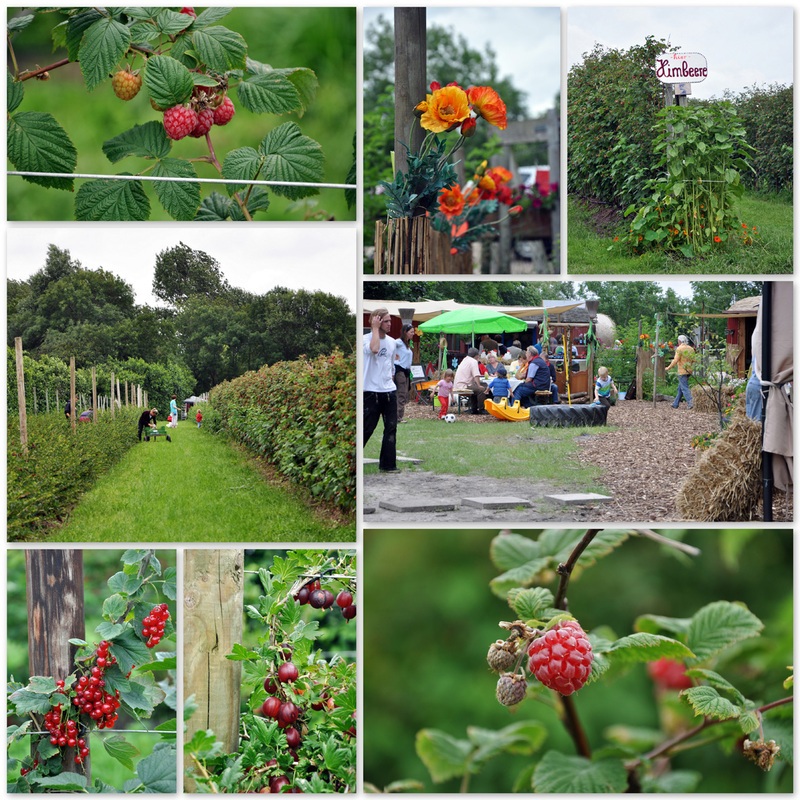 During our holidays at the seaside I got hold of a flyer of a farm where we could pick raspberries, red currants and gooseberries ourselves. I couldn't wait to see how my kids would like it. They are real city slickers. We plant our traditional tomatoes and green beans in the garden in winter, but beyond that they hardly get to see food growing.We ended up with two pounds of each raspberries and gooseberries in our boxes. Another pound went straight into our mouths as we picked. Only this time we had a little too many fruit in our house that needed to be used up quickly. I made a raspberry crisp out of it. A dessert that fills the house wit the smell of cooked raspberries while it'sstill in the oven. Best eaten warm straight from the oven. Put some ice cream or whipped cream on top if you feel indulgent. The best dessert, and very suitable for cold summer days. In a bowl, sprinkle cornstarch over raspberries. Mix gently until well coated. Sprinkle with sugar if raspberries are more on the sour side. Transfer raspberries to 4 individual ramekins. For the topping, combine all ingredients in a bowl. Use your fingers to rub the butter and the other ingredients together until you get a crumbly mixture. Top each ramekin with the oat mixture. 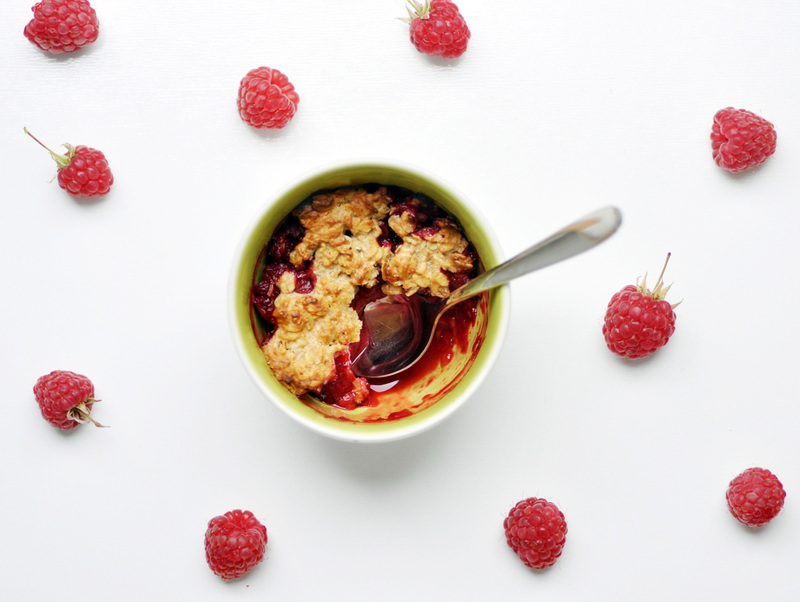 Bake for 20 minutes or until raspberries are bubbling and the oat mixture looks golden brown. Best eaten warm or at room temperature. Top with whipped cream or vanilla ice cream.